on tuesday morning blake had a free period from school and i had promised him a lunch date. 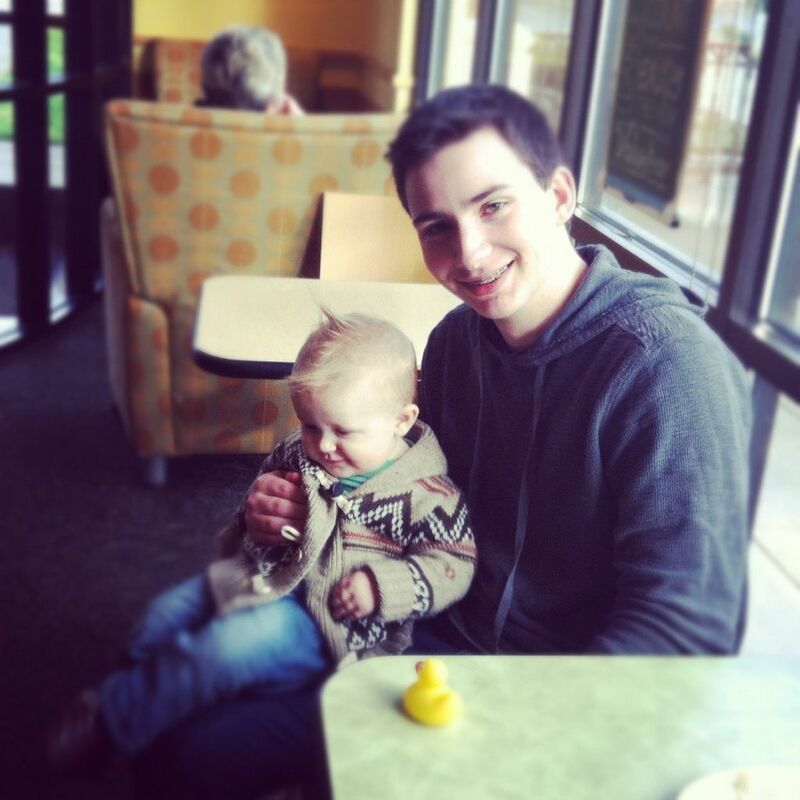 so we loaded up my plus-one and drove him to panera. ("but can't we just go to denny's?") i had a hot herbal tea, blake had a bacon egg and cheese on ciabatta, and henny had an orange scone. i kept calling it lunch and blake kept correcting me. "no, it's brunch." and now you know. i'm telling you, all you single girls out there, my brother is a catch with a capital k.
and now, this is what i wore to brunch (this is a fascinating post). i was telling blake on the way to lunch brunch, "i think this cardigan may have been cuter at the store," and blake said, "so you wore it with red pants. obviously." the nuances of red pants are lost on sixteen-year-old boys, is all i can gather from that. huck fell asleep in the car on the way home. 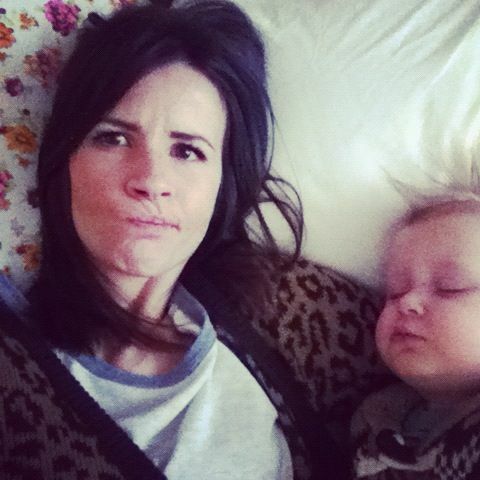 and then after he woke up and asked to nurse, he fell back asleep on me. for two hours! i got nothing done. Red pants - I need a pair! Huck is the cutest! I am loving the red pantalones! I just bought some and the byu campus people stare... And I love it. Color block for lyfe. 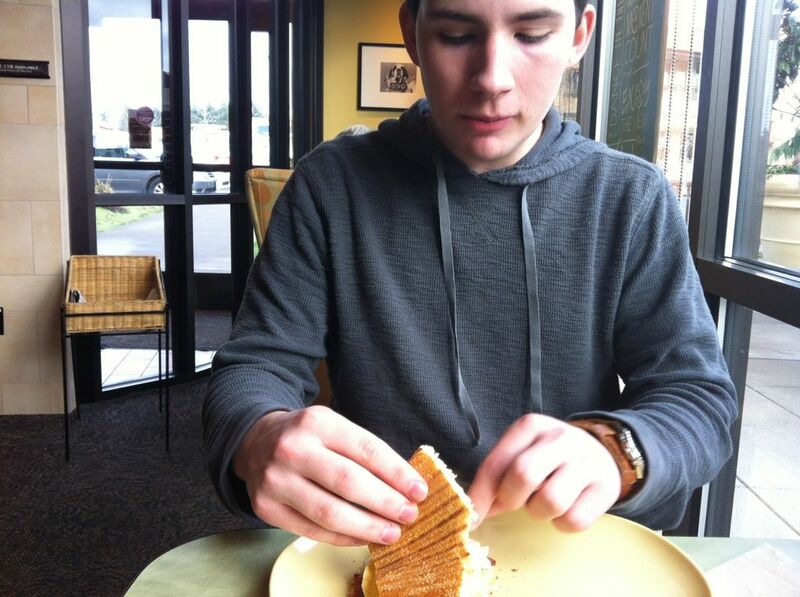 love panera. and brunch dates. 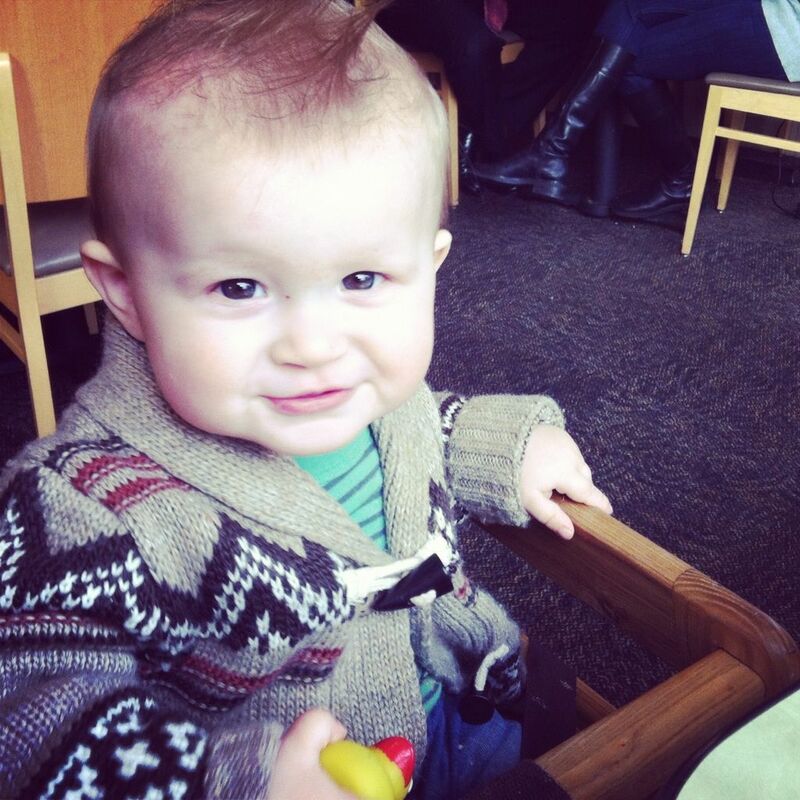 and yes, your brother is just the cutest. i sang in the christmas choir and he was wearing the snazziest outfit + bow tie so i told him and he answered back in a man voice. what?! when did that happen? 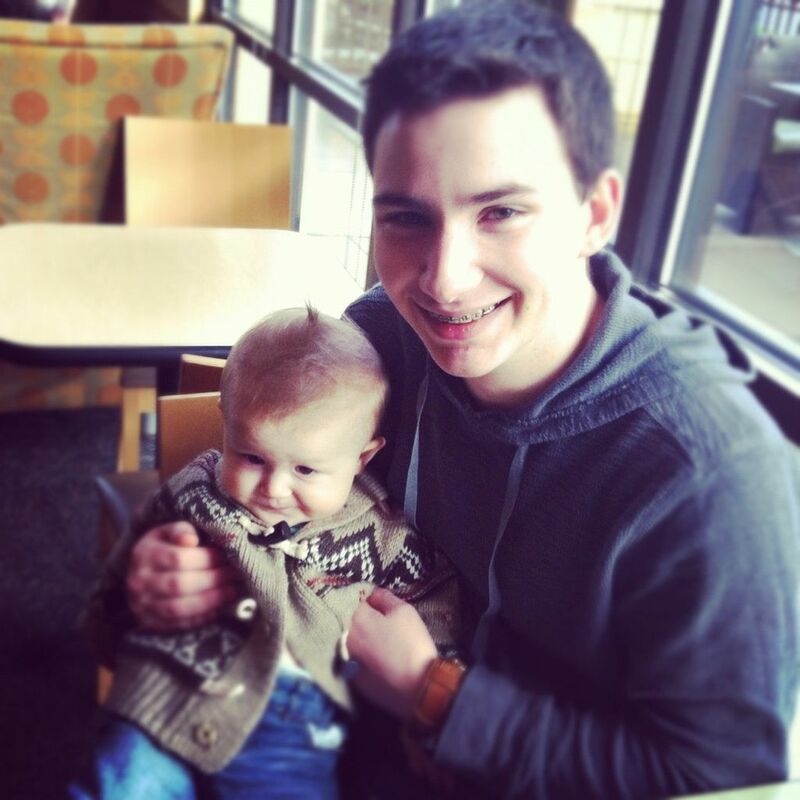 but seriously, he is such a nice kid. i had a bad experience with red jeans in 5th grade. Namely, all my friends dumped me at the same time and told me it was because of my red jeans. I wore them "too much." Not gonna be hoppin' on the red jean train again soon -- I wanna keep my friends this go round. first of all that brother is looker! aren't all little brothers though? second, naturally those pants were paired with that R-A-D cardigan, and third, where did it come from?!? there is nothing like lunch i mean brunch with your bro. best dates. I need that Ferris Bueller sweater! When I was little and people asked what I wanted to be when I grew up, I would say "Ferris Bueller". 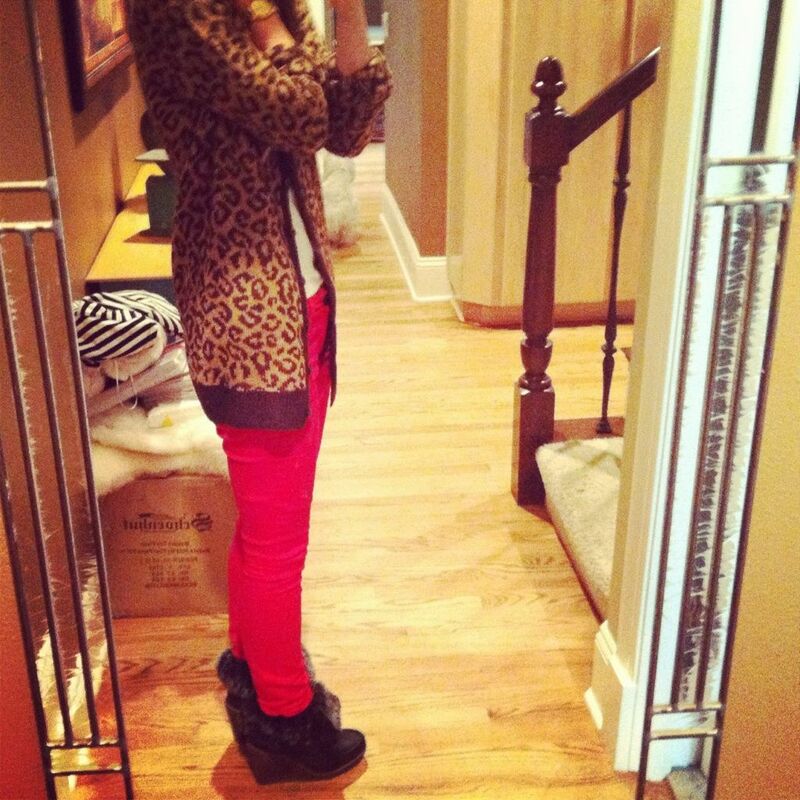 ummmmm i love the red pants! and the sweater! and them together. I love that Cardi where did you get it? who cares what it looked like at the store (though i agree, it really IS the worst) - i think it looks fab on you. and now YOU know. i like the cardigan and the red pants. i think you look quite smashing. please oh please will you go to toast in southeast portland before you head back east? it is the tiny, adorable home of life-changing brunch. when i moved to new york, i was depressed every weekend for two months because i missed it so! the only reason i'm over it now is that i booked a ticket for mid-may, & now i'm counting down instead of crying. I only have coral pants but am thinking a red pair would be so useful and a green pair--actually loads of colours would be useful. 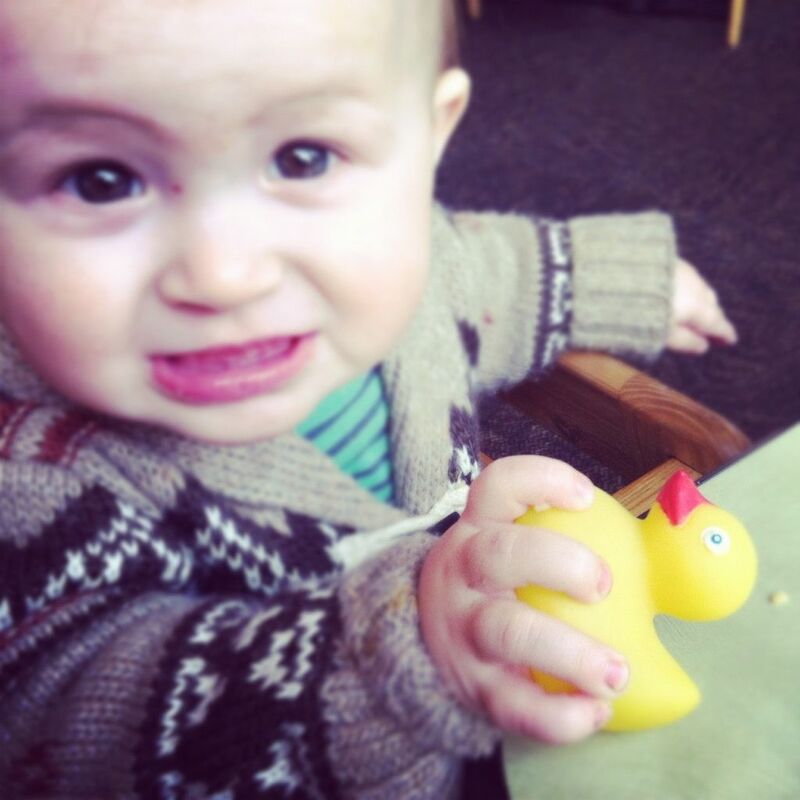 And I like the cardigan nearly as much as I love the last photo--heis so cute! where oh where did you get those red pants and sweater?! I must know! I don't have any full on pants of different colors, just the plain old boring colors (black, khaki, grey, etc.) but I do have a pair of camo skinny pants that I love. And capris...forget about it, I have an affinity for buying them in every color imagined. It's totally the Ferris Bueller cardigan.. now go get yourself a grey leather jacket and a black beret and your all set! Your brother is such a stud!! And I miss you. A LOT!